Safe-T-Alert white CO/LP gas alarm get the best of both worlds in one space saving design! Did you know you need to change your CO/LP Gas Alarm every 5 years? LP gas alarms are required in RV’s to protect you and your family from the dangerous fumes that creep around campsites and inside RVs. CO and Propane gas can enter your RV from all sorts of places – engine exhaust, stove top burners, other RV’s, campfires, water heaters, even refrigerators can emit deadly Carbon Dioxide and LP Gas fumes. The Safe-T-Alert Combination LP Gas and CO Detector alerts you when levels of CO, LP Gas and Compressed Natural Gas (CNG)/Methane become dangerous giving you precious time to exit your vehicle and keep your loved ones safe. If you have the older CCI model of gas detector we have listed a conversion chart that gives you the direct Safe-T-Alert/MTI replacement for your older CCI gas detector. You can find the chart under LP Gas detectors. If you do not see yours listed, please call MTI at 800-383-0269. Each year over 400 Americans die from unintentional CO poisoning. More than 20,000 will visit the emergency room from CO and LP Gas contamination according to the Center for Disease Control and Prevention. Don’t let this happen to you. 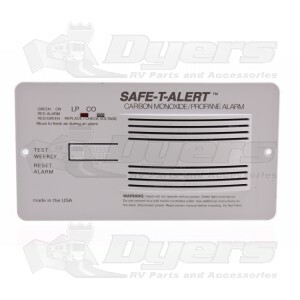 Replace or install a Safe-T-Alert CO/LP Gas Detector today from Dyers. Dual CO / Gas Alarm - Also detects Compressed Natural Gas (CNG)/Methane. Interconnect up to 9 alarms - all connected units sound the alarm. Test/Reset Button - Tests all detector functions with one touch. Resets and Mutes alarm while safety and corrective actions are taken. Ordering was fast and easy, the product was much less than local prices for the same product...including the shipping. The shipping was relatively fast. Overall a good shopping experience. This alarm works great and fits in the whole where the old one was. Worth waiting while it was on backorder. this was a replacement of the same item (original alarm reached useful lifespan). i shopped at dyers as they had the best price. shipped quickly and packaged well. Good product. Easy to install. Works great. Dyers was efficient with the order and handled it flawlessly.